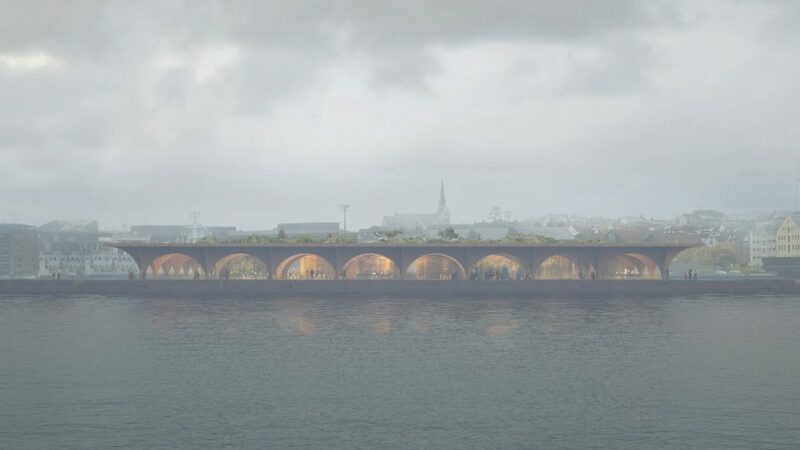 Danish firm COBE has unveiled plans for a craft brewery in Stavanger, Norway, featuring a harbour bath, a street-food market and a huge rooftop vegetable garden – all framed by a network of wooden arches. COBE is working with Norwegian brewery Lervig to create the 11,000-square-metre brewery and visitor centre on the edge of a fjord. The building will comprise a huge grid of wooden arches. The brewery will be at the centre, surrounded by a spacious public promenade, while a garden will cover the entire roof. The project came about following a period of huge financial growth for Lervig. The brand wanted to show its presence in its home city – so decided to create a facility with a variety of activities to offer visitors, from swimming in the sea to sampling unusual foods. "Over the last couple of years Lervig has experienced a continual increase in sales and as such, we have now outgrown our current premises," explained Lervig managing director Anders Kleinstrup. "Normally you would see a brewery move out of the city, in search of a cheap greenfield site, fit for expansion. This isn’t the case at Lervig. We believe that we have the possibility to create something very unique in Stavanger at Bekhuskaien." "The project will become an oasis for all ages – taking space back to the city!" he added. "I'm sure that the combination of it all could bring Lervig and Stavanger onto the international scene as a 'must see' for craft beer drinkers, nature lovers and foodies." The openness of COBE's design will ensure that visitors will be able to see the brewery's tanks and fermentation vessels from all around the building. Similarly, the roof garden will function as both a public facility and a space where the brewery can grow hops, vegetables and fruit trees. "Our vision is to create a vernacular attraction and destination in the heart of Stavanger," said COBE principal Dan Stubbergaard. "Breweries have always been perceived as closed-off facilities. By wrapping the brewery with a range of public functions within a single structure, we are able to create a project capable of making citizens and visitors come together and enjoy city life," he continued. "With the new brewery, the site will reconnect with the city not only physically, but also socially." COBE is based in Copenhagen. The studio is best known for projects including a golden library in its home city and a studded museum in Roskilde. Other buildings the firm has in the works include a landmark building at Adidas' global headquarters and a Danish railway interchange.